An interview, dated 1895, with the engineer, Walter D. Bassett, regarding the construction of the Great Wheel at the Winter Gardens, Blackpool. The gentleman who gave London its new plaything this year is at present in Blackpool. He is Mr. Walter D. Basset, the man who has 'taken the " gigantic wheel " business under his care as affording variety to the managing directorship of the large firm of marine engineers, Messrs. Maudslay, Sons, and Field, of London. And from what he told me, during an interview this week, his catering to the public craving for new sensations is putting money in his pocket. As Mr. Basset says, if a man wants to make a pile with little exertion, he has to get hold of some novelty. In purchasing the English and Continental rights of the gigantic wheel from Mr. Graydon, an American, the engineer therefore considers he has done a good stroke of business. For he tells me that one half of the great wheel at Earls Court is h property, and that the Syndicate which controls it has paid a dividend of 20 per cent. upon the capital, besides allowing a substantial sum for renewals and repairs during the winter, and writing off £3.000 for depreciation. Which is not bad, considering it was earned in little over three months. It was a cold morning, and we both held our coat-tails over a bright fire in one of the Clifton Arms Hotel rooms whilst we juggled with facts and figures. “This is my own private work. I'm a believer in the one-man principle, and I have carried this thing out myself. No, my firm builds marine engines and constructs Belleville tubular boilers (yes, we did rout the opponents of tubular boilers in Parliament); and at present there are orders at the works representing half a million of money." “The wheel at London, and the wheel that is to be at Blackpool, are both of my own design. 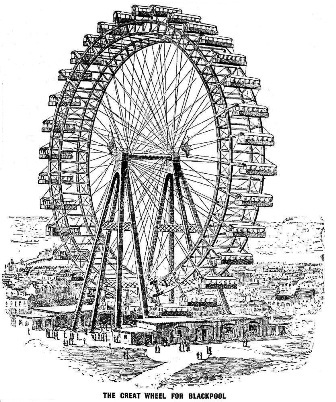 With the assistance of my head draughtsman, Mr. Booth, I have worked out all the details, and I was directly responsible for the erection of the London wheel." If the reader had been present at this interview he would probably have taken another good look at the youthful-looking man who carries so much responsibility upon his shoulders. And then he would have noticed the shrewdness which characterises the engineer's face. Quickness of perception is shown in Mr Basset's conversation; betrays all the nervous energy, readiness of thought, and the promptness of action of the London business man. “Neither. A separate Company has been formed to work it. The site is leased from the Winter Gardens Company, who will be represented on the directorate of the other concern; and I shall build the wheel for them." When I asked for some details of the work, Mr. Basset commenced: “The wheel, you must know, is constructed on the principle of the bicycle wheel. It will be 200 feet high, carrying 30 carriages, each of which will bold 40 passengers. That gives a total capacity of 1,200, and as the wheel will make four double revolutions per hour, we calculate to handle nearly 5,000 persons during that time. The entire weight of the machine will be about 1,100 tons the people will probably weigh another 100 tons." “At Blackpool we shall not have the turrets at the top of the supports, nor the tunnel through the axle. They have not been patronised so well as was anticipated at London, so we shall dispense with them here. The axle for the Blackpool wheel will be forged out of solid steel. It will be 27in. in diameter, with a boring of 8in. through the centre, and will weigh 25 tons." “About £45,000. I have learnt something from experience. The Earl's Court wheel cost something like £59.000, but that wheel is a little larger, and it was the first ' I had_ undertaken. Most of the material will come from Glasgow. You know this is mostly bridge work, and bridge work is not: our speciality, but the delicate parts will be manufactured in London." "Oh, yes, the Wheel will be perfectly safe. We have escaped without accident, so far, although before we got properly running at Earl's Court some of the passengers got stuck up in the air for a little time." "You were not among them, were you? Well, I'm glad -You saw it in course of construction! Oh; it will be a different matter here. We had some difficulty at some stages of construction, but I'm up to every move on the board now, and I expect the erection bore will go on without hitch. We shall build both sides of the wheel at once—expecting to commence in about a fortnight." “I have been in negotiation with a view to erecting a wheel at Paris, but it will be several months before I proceed with that. The novelty of the thing will die, you say. Perhaps so in course of time, but at London we did better business in October than we did in August. Beside, if the novelty expires before our lease at Earl's Court (21 years) is up, we can take down the wheel and erect it somewhere else-probably in the East End, and take up the people at 3d. per head. What I want to impress upon you, however, is that the expenses are so absurdly trifling. They cannot amount to over £100 per week, and that is a consideration not to be overlooked." “I don't think so. The plans were before a meeting of the Corporation Committee on Tuesday, and all went swimmingly. Then it cannot be said the wheel will interfere with any rights of light, because it is all lattice work. No, everything is favourable, and I expect to have the machine running next June." “Nearly all; there is only a small amount to get in. Good-bye."